Today's experiment is another classic. It was still fun to watch these many years later. Yes! Didn't you know that raisins like to boogie? 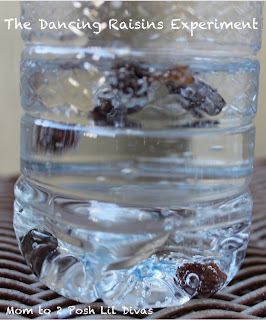 some fun as you watch raisins dance in this simple & fun experiment. 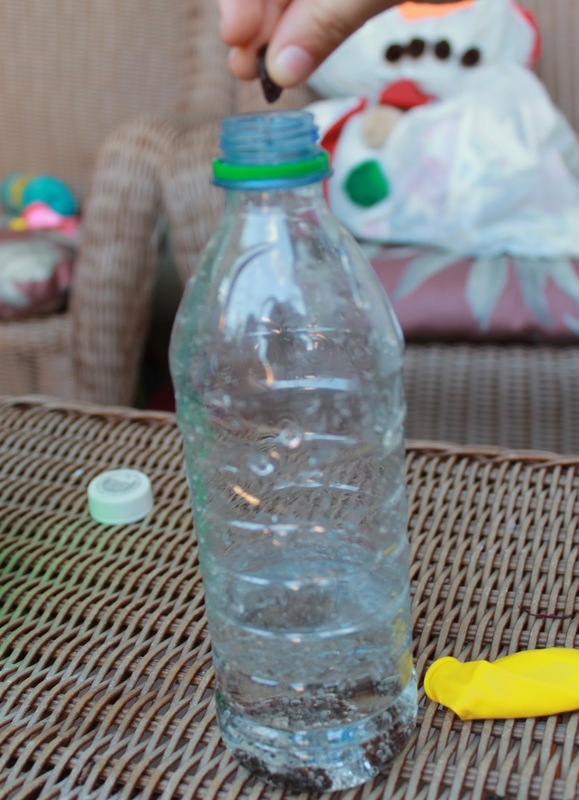 I filled our bottle about 1/3 of the way. 2. Drop in some raisins. How many? That is up you. 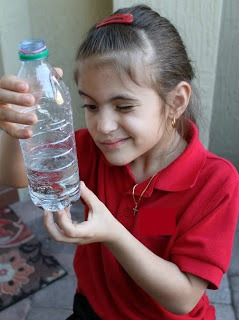 For comparison we also did the experiment using plain water. 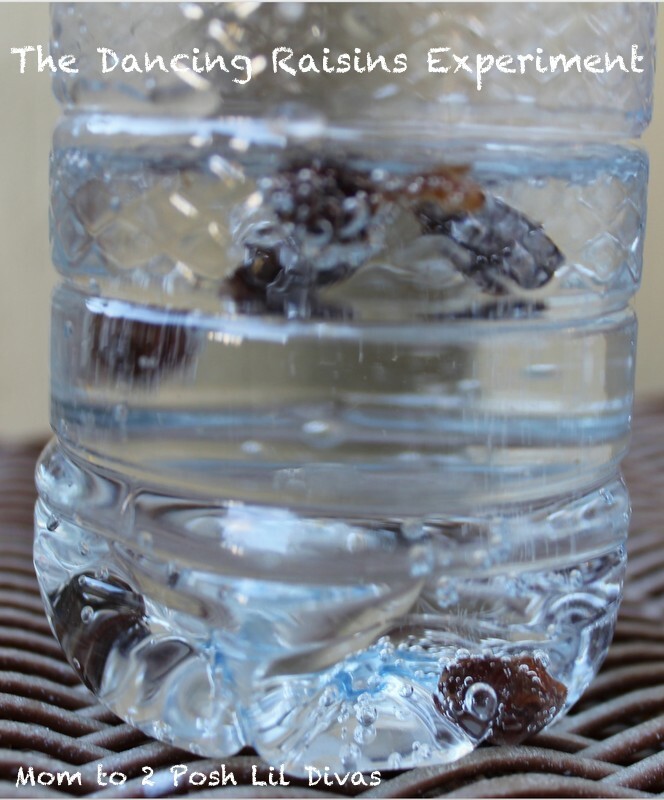 The science behind it - Raisins sink in water because they are more dense. 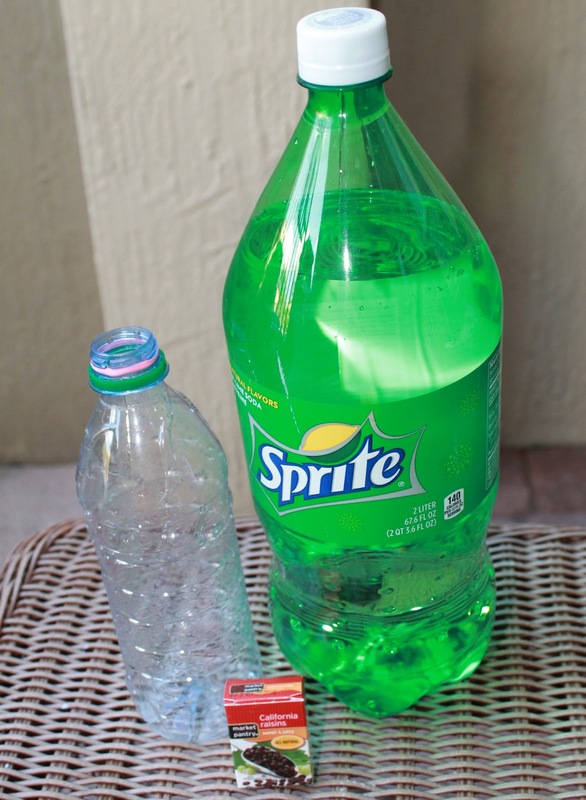 Soda on the other hand has carbon dioxide and forms bubbles of gas. Those bubbles attach themselves to the raisins and make it float. When the bubbles pop, the dense raisins fall back to the bottom of the jar. This up and down motion caused by the bubbles makes the raisins appear to be dancing. FUN! Who knew raisins were the life of the party? Love this fun (and easy) experiment! Thank you! Be sure to have lots of raisins on hand! My girls wanted to keep adding them in & we repeated this more than once - FUN! one more experiment we have in our to-do list! :) My list is long too! The girls have really shown interest in the fun science stuff so I am definitely going to be incorporating more of that with them. This was a lot of fun for us. When I was a kindergarten assistant teacher, we did this in our classroom. It is such an awesome experiment! what a cute idea!! I am def. going to have to do this with my boys!! Thanks for sharing! They had lots of fun doing it!!! We used a whole BIG thing of raisins and used them all! Excellent! another great experiment to try....very inspiring week of fun! You are an awesome Mom! Your kids are so lucky to have you as a Mom and vice versa! Aww, thanks Melissa. We are blessed and we have some fun together! good question. I didn't try it because I wanted something clear that you could see through to observe the, but I imagine any fizzy soda would work since it's the carbonation that does the trick. How cool!! I didn't know raisins did that.. Learn something knew everyday :) Thanks so much for sharing this with us on Sharing Saturday. This looks so fun and simple! 1. Craisins instead of Raisins. Craisins are slightly less dense and tend to dance faster & longer. 2. Make your own fizz! Use water, a spoonful of citric acid crystals and a spoonful of baking soda. 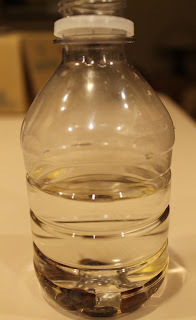 Making your own soda water doubles the content potential for this one. is this something we could do in individual bottles for them to take home. Will it keep working? 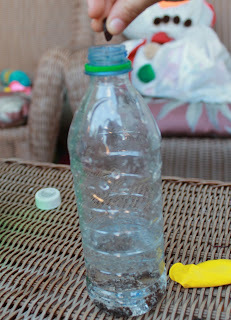 This is a very fun experiment for preschoolers, thanks for the idea. I am wondering if you could use something other than raisins and still get the same results? As the National Association of Education for Young Children asks preschool teachers to not use food in activities. As to not promote "playing with food", since there are so many starving people in the world. I'm thinking maybe marbles or pennies might work? Any thoughts?